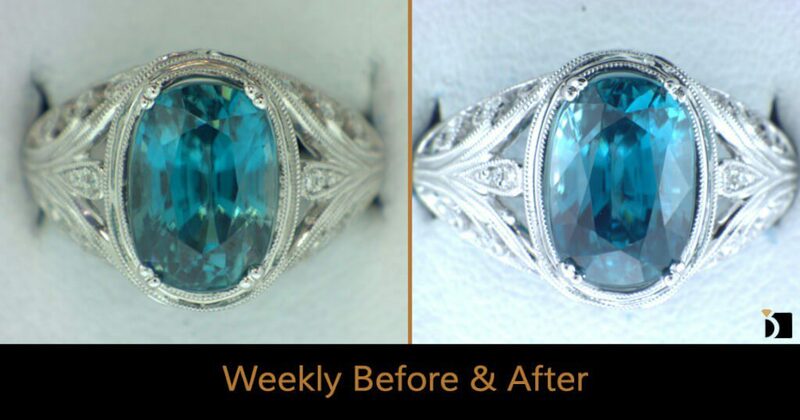 On this edition of the Weekly Before & After, we have a beautiful 14k White Gold Ring with a 9ct Oval Blue Zircon and Diamonds Ring. This ring that had to be resized up a whole three and a half sizes! For a sizing of this scale, the standard methods would not work, so what is known as a half shank was performed. This process required the back half of the shank be removed and replaced with a new shank to accommodate the needed three and a half sizes up. Laser welding was used on this ring to attach the half shank. It was then wrapped up with a Rhodium Clean & Polish and there we go!